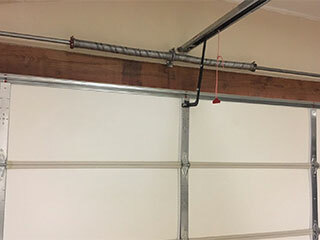 Every home’s garage door relies on a set of heavy-duty springs to help it move up and down. These springs are immensely strong, and can be counted on to last for several years. They do have a limited lifespan though and will wear out after years of regular use. If your springs have snapped, or if they’re showing signs that they might be about to break, it’s essential to arrange a replacement as quickly as possible. When Should You Replace Springs? A typical door spring lasts between 3,000 and 10,000 cycles - sounds a lot, doesn’t it? However, a busy household can easily use their door more than a thousand times per year, which means you might find your springs beginning to weaken after just a few years. We always use the strongest and most durable springs, so you can rely on them to last for a long time. Before your springs break, they’ll often give off signs that they’re going to fail. If your door sags or wobbles as it moves, then your springs may well need to be swapped out. In addition, you might find that your door fails to balance properly - if this is the case, contact our technicians as soon as possible. When it’s time to replace your garage door springs, our technicians will first safely secure the door in place. After doing so, they’ll disconnect the spring (or, if you have a larger door, the pair of springs) that have worn out. They’ll then fit a replacement spring, carefully adjusting the tension to provide proper balance. Do not try to do this yourself - these springs can be exceptionally dangerous if not handled by a trained professional. If your springs have broken, or might be about to break, contact Garage Door Repair Merrick today. Our technicians are ready to help - find out what we can do for you.